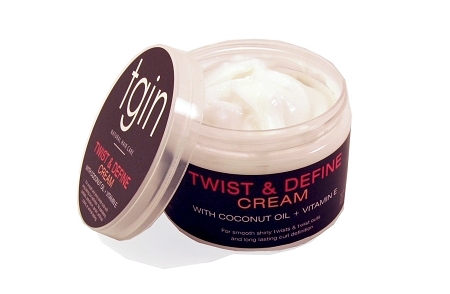 When twisting with the Twist and Define Cream, we highly recommend you use tgin Butter Cream Daily Moisturizer to take down your twist for extra softness. Directions: After washing and conditioning with tgin Sulfate Free Shampoo and tgin Intense Hydrating Conditioner, make sure hair is thoroughly detangled. 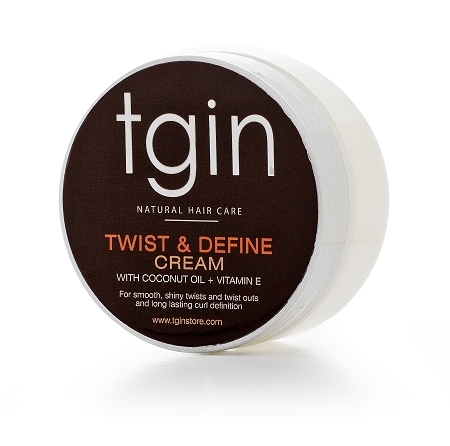 Apply tgin Twist & Define Cream to damp detangled hair in small sections and comb through from root to tip before twisting. Mist untwisted section with water before applying product if hair begins to dry. For best results, allow hair to air dry. For maximum shine and softness, go over each twist with tgin Butter Cream Moisturizer once hair is dry and/or before untwisting. Ingredients: WATER (AQUA), COCONUT OIL, GLYCINE SOJA (SOYBEAN) OIL, PVP, AMINOMETHYL PROPANOL, POLY-SORBATE 20, TOCOPHERYL ACETATE (VITAMIN E), PANTHENOL (PRO-VITAMIN B), CARBOMER, FRAGRANCE, IODOPROPYNYL BUTYLCARBAMATE, DMDM HYDANTOIN.